The WILDTRUST, a leading South African environmental NPO, is partnering with multinational corporation, The Dow Chemical Company who are driving innovations that extract value from material, polymer, chemical and biological science to help address many of the world’s most challenging problems. Their support for the WILDTRUST will be rolled through a grant assistance programme known as the Dow IMPACT FUND, to deliver on a ‘circular economy’ programme that will enable a cleaner environment through recycling, job creation and social well-being. Despite its magnificence and cultural diversity, South Africa is unfortunately plagued with two challenges which are unemployment and poor waste management. South Africa has a current unemployment rate of 26.7% which equates to 6 million unemployed South Africans, most of whom can be found in rural and peri-urban communities. WILDTRUST CEO, Dr Andrew Venter says that to address these challenges, the partnership with Dow will support the expansion of the WILDTRUST’s Recycling Village model through which collection points are established in shopping centre parking lots, enabling the potential collection of over 1 200 000 kgs of recyclable waste from approximately 10 000 local homes. Furthermore, the project will see the underwriting of a sustainable clean-up operation of the Durban Harbour. It will ensure the ongoing removal of the waste that accrues in the harbour, through the employment of a dedicated team of local community members as part of the WILDOCEANS’ Blue Crew (a team of local female entrepreneurs, who collect waste accumulating along our coastline). This will enable the collection of over 100 000 kgs of recyclable waste from the Port, including 60 000 kgs of plastic material that would otherwise land up in the ocean. “This important and impactful partnership creates a space to work together to achieve the outcomes that form part of our sustainability vision, and addresses South Africa’s waste and unemployment challenges”, concluded Venter. The project will also support post-consumer end-use application innovation underwriting the establishment of an experimental extrusion line to test the ability to blend various combinations of multi-material, multi-layer and other unrecyclable plastic into a recyclate that can then be beneficiated into end-use applications like Green Desks, building materials and diesel. Based at the WILDLANDS’ Midmar Recycling depot, this will be run by the existing depot management team and create employment for additional depot-based community members. Through the WILDTRUST School’s Recycling Programme, these initiatives will be further enhanced by educating the children about recycling, plastic, packaging and the circular economy with the aim of reaching 25 000 learners across 50 schools. 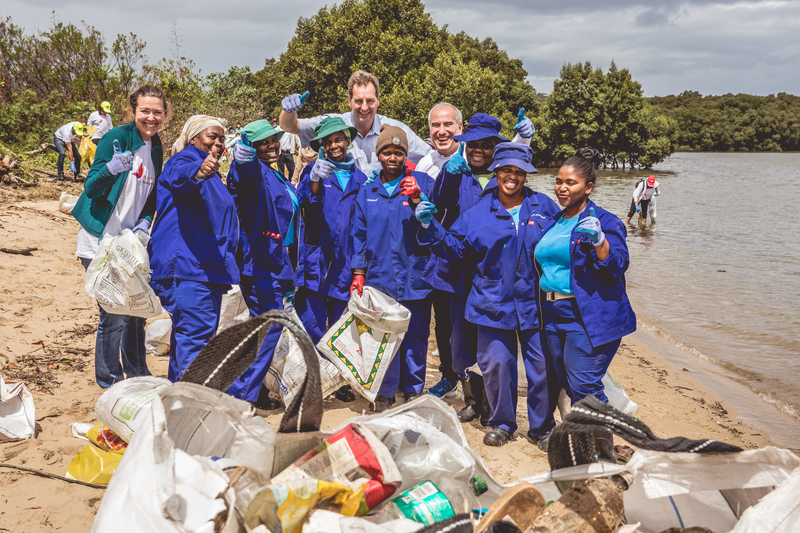 Dow and the WILDTRUST also joined forces to launch Project Butterfly, an Africa based initiative started by Dow, to clean-up part of the Durban Harbour. Coming together with their customers, stakeholders, partners, government agencies and NPOs, they collectively cleaned part of the Bayhead Mangrove Swamps. Afterwards a networking session was held to further cement their commitment to those making inroads towards a cleaner environment, and to making a difference to local communities.